ingr > English edition > The Legend in Boston! 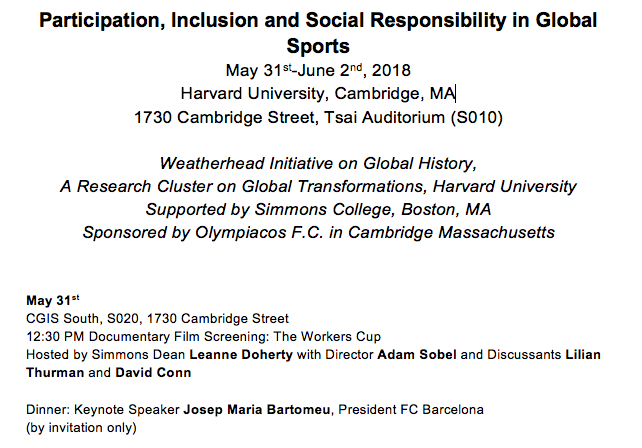 The Harvard University; conference entitled “Participation, Inclusion and Social Responsibility in Global Sports” is about to begin and Olympiacos has checked in! Olympiacos extensive partnership with Harvard University continues. 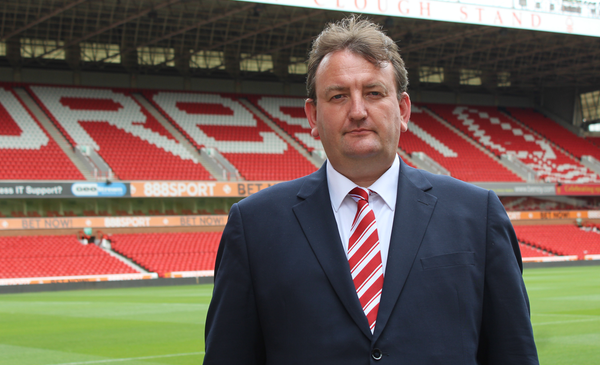 The Legend of Greek sports has been supportive in the acclaimed, US-based University’s efforts to raise public awareness on social responsibility that football and sports, in general, have to display; also, on the support to society they have to provide; on the right to participate in sports, which is an inalienable right of humans on Earth. Olympiacos is not a mere guest or visitor; Olympiacos contributes immensely so that the Weatherhead initiative on Global History, a Research Cluster on Global Transformations, by Harvard University with the support of Simons College, will deliver the anticipated results. It should be reminded that Olympiacos is sponsoring this initiative and attends proceedings in Boston, as a teammate of Harvard University and Simons College! 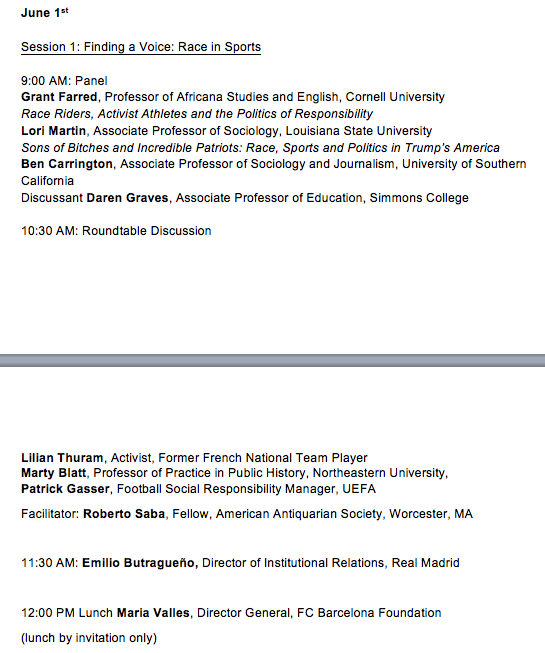 Officially, the works of the conference “Participation, Inclusion and Social Responsibility in Global Sports” start Friday morning. 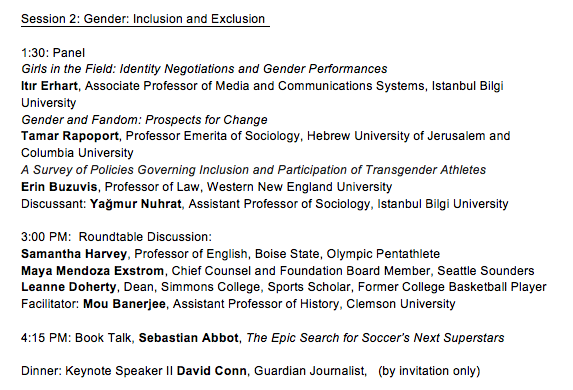 The agenda, which is available to review in detail in the photos following this text, covers various topics that will extensively discussed in these 2 days by sports people and academics, who both strive to make football and sports as a whole a driving force that will make a better world in the future. They endeavor to turn discriminations, borders and segregation into something of the past and bring people close r to each other via sports. Mr. Evangelos Marinakis stood next to this great effort since its beginnings and set our Olympiacos, a Club led by him, at the disposal of Harvard people, in order to develop their work and deliver results in their research and debates. 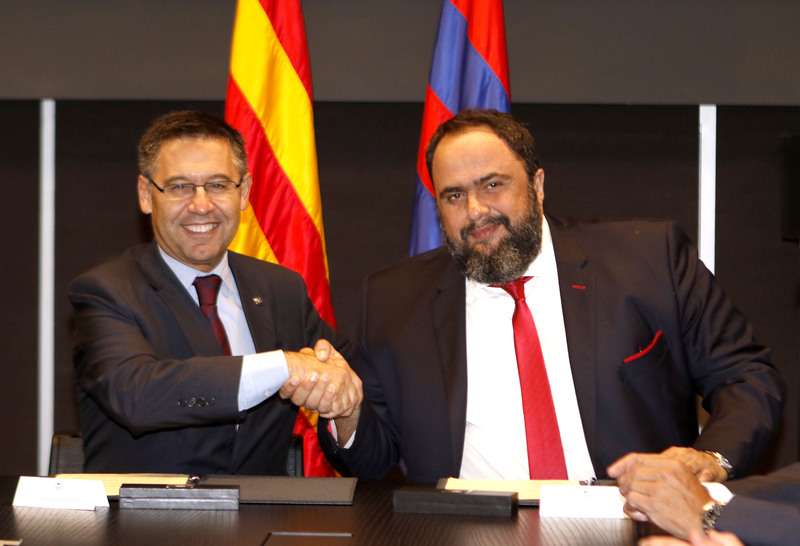 The main outcome of that has been “The Athens Principle” on the right to participate in sports that was signed first by Mr. Marinakis followed by Barcelona, Real Madrid, the Euroleague, Sporting Lisbon and Fenerbahce. Last September, Olympiacos hosted in Greece all main figures of this effort and this year the Club takes part, as a true teammate, in the Boston event to support Harvard University. 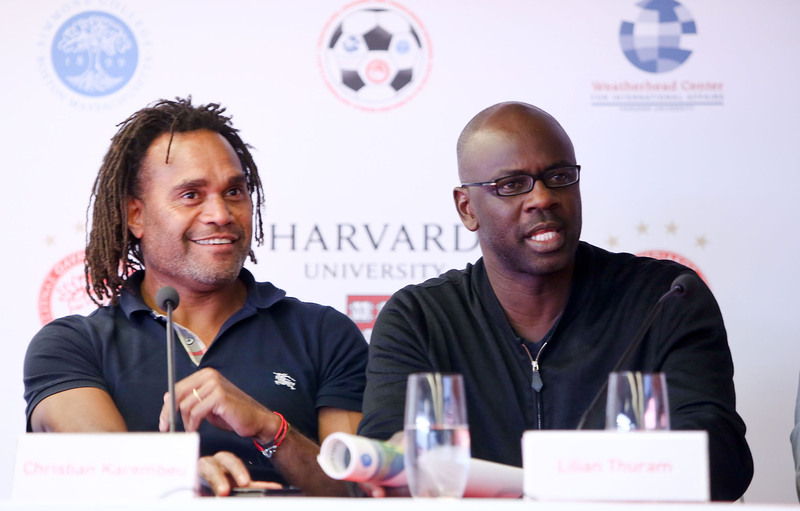 The event in Massachusetts is attended by Christian Karembeu, Kostas Vernikos and Kyriakos Dourekas, as well as the likes of Real Madrid, Barcelona, Nottingham Forest (the English Club is being represented by Nicholas Randall), many academics and sports figures, and, in particular, major former footballers such as Emilio Butragueño and Lilian Thuram. 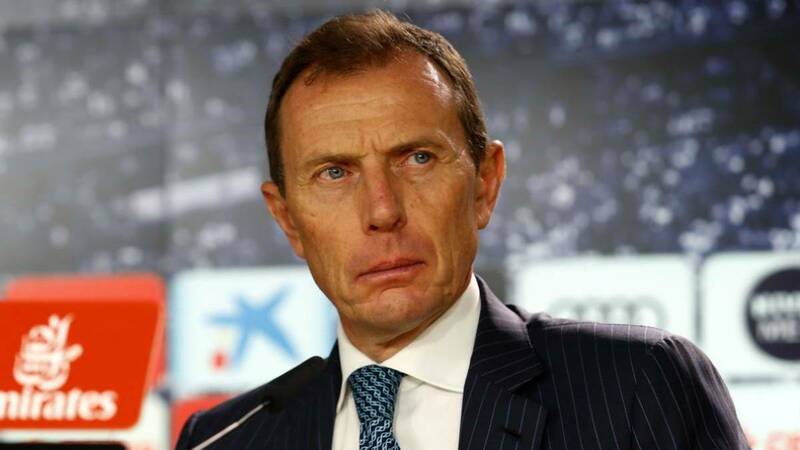 On Thursday May 31st, a dinner is scheduled to open the conference entitled “Participation, Inclusion and Social Responsibility in Global Sports”. Keynote speech will be delivered by Mr. Josep Maria Bartomeu, President of Barcelona! 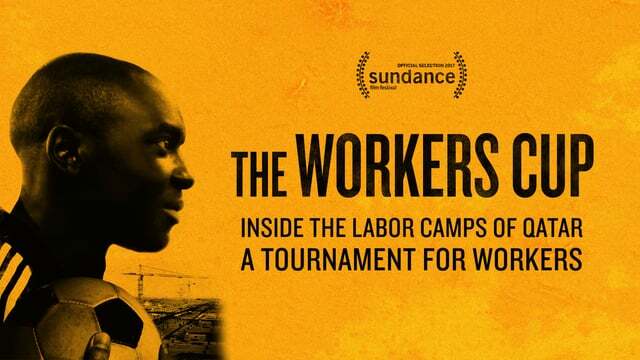 Before that, screening of the documentary “The Workers Cup” is scheduled with hosts being the Dean of Simmons College Leanne Doherty, director Adam Sobel, and journalists Lilian Thurman and David Conn as the main speakers. Early in the morning of Friday June 1st, conference proceedings will kick off and Olympiacos will hold an honoring place with Christian Karembeu to point out in his address the importance of sports to society!